Christmas lights always get me out of a Bah Humbug mood into a Jolly Holly one! I love to drive around and see the lights during December and marvel at the lengths some people go to in decorating their homes for the holidays! There are lots of homes in lots of neighborhoods that really dress up in holiday lights, but the quintessential neighborhood for Christmas lights has got to be Windcrest! Windcrest is a small incorporated city in northeast San Antonio, near both Randolph AFB and Ft. Sam Houston. It’s a favorite for both active duty and especially retired military families. One of the city’s traditions for the past 30+ years is their annual Light Up! Also in northeast San Antonio is the Olympia neighborhood, located in the several blocks behind the Forum shopping center at IH-35 and 1604. Homeowners there are giving Windcrest some serious competition! One of my favorites is Shavano Park, another small incorporated city, located inside 1604 near NW Military. It’s a little more spread out, so there are pockets of streets that are more decorated than others, but the ones that are, really are! This is an area I personally love to visit and drive through! 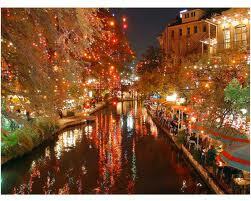 Then, of course, we have the most spectacular Christmas lights of all–the Riverwalk! It’s truly breathtaking to see all those lights hanging in trees and twinkling in the reflections on the water. 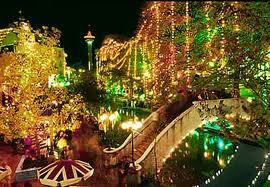 The Riverwalk is San Antonio’s most favorite and famous tourist attraction besides the Alamo, and during the holidays, there’s just nothing like it anywhere! You’ve just got to see it–pictures are beautiful, but can’t capture the real beauty and feeling of being there. Something new this year is lighting under water in the new museum reach! Hop on a barge and take a tour–I’ll be doing just that this week with a group of my realtor friends! Get your holiday spirit in full gear! Take a drive and enjoy the lights!